2,169 km of cycling - as part of a bicycle world trip - from Cordillera Blanca on bumpy Panamericana through the Andes Mountains southwards via Cerro de Pasco to Ayacucho, then down to Pisco at the Pacific coast, by boat to the Islas Ballestas, then to Huacachina for some decent sandboarding, by plane over famous Nazca Lines, reascending the Andes to Cuzco, by bus to Arequipa and Canon del Colca, on foot to Machu Picchu, then following the Altiplano southwards to Lake Titicaca at the Bolivian border. 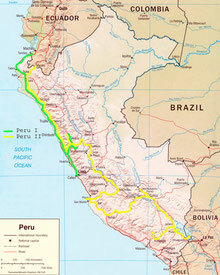 Do you like Cycling Peru II? Having survived more than 70 hours of bus rides across northern Peru and Ecuador, I finally arrived back to Huaraz in Cordillera Blanca in the beginning of August. After more than one month without cycling I could hardly wait to hit the road again! I enjoyed being on the move again while heading eastwards, crossing passes of high altitude, some of them more than 4,600 m above sea level! Started on paved roads, these soon changed into terribly bumpy dirt roads, which made me going at extremely slow pace. As hospedajes became more and more rare, I found myself sleeping in places such as a local town hall. The following days were full of extreme high-altitude cycling in georgeous Andean landscapes, all the time up- or downhill. So it was just a matter of time until I found myself cycling in a snowstorm, approaching the highest city of its size on the globe: Cerro de Pasco at 4,330 m above sea level. The road to Ayacucho turned out to be a slow-making dirt road again. After these more or less enjoyable bumpy days I decided to do a loop to the coast. Therefore I found myself crossing several high ranges while heading westwards, climbing my - so far - highest pass at 4,746 m above sea level. A by all means exhilarating experience! After endless ups and downs, all of them above 4,000 m, I finally dropped down to Pisco at sea level. Famous for uncredibly huge amounts of seabirds, penguins, pelicans and seals, I gave the Islas Ballestas a visit by a boat tour to get closer to these fascinating animals. A fairly smelly experience because of countless layers of guano covering the entire archipel! Nevertheless an impressive and unforgettable wildlife sight. I could have done this for weeks, but about 150 km further south the world-famous Nazca Lines were waiting for me. And as they could be seen only from above, one needs to take a flight. And so I did! For about half an hour I took a birds-eye-view in a Cessna plane flying over the 800 lines and 300 geometric figures spread across the desert. Until today there is no certain evidence of their purpose. Extraterrestrial landing sites or astronomical calendar? Probably rather a giant map of waterways involved in a water worship to bring back water after decades of dry. Who knows? 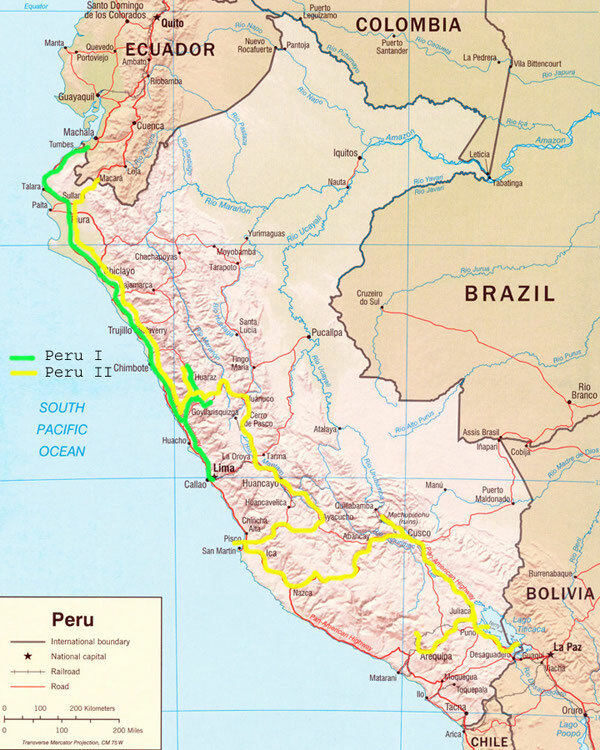 I turned back into inland Peru, across the western Andes to Abancay and from there further south to Cuzco, heart of the ancient Inca Empire. Actually I wanted to meet Brit and Franziska here, two German girls I worked with in Australia. But as they just booked an 8-day-jungle-trip we hopefully would meet in a couple of days. But as I neither wanted to go alone to Machu Picchu, nor to spend eight days in Cuzco just waiting for them, and as at this time Dan and Griffo, two Australians I had met before in Pisco, were in Arequipa right now, I spontaneously decided to go by bus to Arequipa for meeting up with these guys and doing some decent trekking in the nearby Canon del Colca, one of the deepest canyons on earth. Before that, I got myself a free yellow fever vaccination and a painfully expensive refreshment of my rabies vaccination. I strolled around Cuzco Old Town with its narrow lanes and colonial buildings before heading to Arequipa by overnight bus. I spent hours with walking through Santa Catalina, a monastery just a few years ago opened to the public. In some way a kind of city within a city, it had an incredibly captivating atmosphere, which made me even feel as if I could stay there as one of the nuns... But fortunately I preferred meeting up with Dan, Griffo, Robbie from New Zealand and Bartek from Poland for a couple of beers in the evening. We ended up hoping to meet each other again anywhere in South America, before I catched my bed for two hours of sleep, cause at 1:00 am I got picked up for my Canon del Colca trip. Together with Nathalie and Jutta from Germany and our more or less useful guide Gladis I took a bus to the canyon. We walked down the steep trail to the canyon`s bottom, which was fairly deep but by no means as spectacular as at the deepest point. But an oasis with pools and some nice palm trees at the canyon's bottom gave some kind of compensation for the more or less dissapointing views. Next morning we went to Cruz del Condor, a viewpoint at the canyon's rim, where condors usually rose up the canyon using the thermic currents and then flew spectacularly close above the spectators heads. Really impressive! Having spent some lazy hours in Chivay's hot springs we went back to Arequipa and back to Cuzco the same day. We gave some Inca ruins in Cuzco's surroundings a visit, before Bartek arrived. Now being a group of four, we decided to go together to Machu Picchu. As there were no roads to Machu Picchu and as actually the only way to get there was by hyper-expensive tourist train, we decided to follow the railway lines on foot, getting a for free "Stand-by-me"-feeling as in the Hollywood movie with the same title. As Brit and Franziska decided to go by bicycle as close as possible, we just met for a few hours, but hopefully would catch up again anywhere in Bolivia. After a terribly bumpy overnight bus ride to Santa Teresa we dropped into the nearby hot springs, before crossing the Urubamba River by a small open cable car. It took us about five hours of walking along the railway lines to reach Aguas Calientes, the small village underneath the famous ruins. As Nathalie didn't feel good next morning, the girls took the overprized bus, whereas Bartek and me climbed the steep trail on foot in the dark, just in time to catch a first glance of the ruins at sunrise. Enigmatically they were lying in the early-morning-mist! An unforgettable first sight of this for such a long time undiscovered and forgotten mysterious site! Even today there was mainly speculation about its function and use. Meanwhile it was clearing up, we climbed the steep "Machu-Picchu-Mountain" Huayna Picchu, from where there were breathtakingly awesome views of the whole site. After having strolled through the ruins and surprisingly having met Natalie and Fabian from Germany, with I had had some sandy sandboarding experiences in Huacachina, we were sitting on a remote Inca terrace with view of the ruins in the afternoon. In some people's point of view Ayers Rock is just a rock, Angkor Wat is just a temple, the Great Barrier Reef are just corals and Machu Picchu is just ruins. But there was so much more to see, when just closing the eyes! So I did. And it put a smile on my face. It was one of those moments I would never forget. Cause it was totally silent and I was sitting on an Inca terrace, high above Machu Picchu! As Nathalie didn't feel better and as both of them wanted to get to Lake Titicaca as soon as possible, they took the train back to Cuzco, whereas Bartek and me followed the railway lines on foot, for this time in the opposite direction, for 42 km to Ollantaytambo. It was heavily raining for two hours, but why bringing a raincoat... Totally wet, but I knew that this had been the appropriate way to approach a site like Machu Picchu! Back in Cuzco I said goodbye to Bartek, even if just for a short time, as we planned to catch up again at Lake Titicaca or otherwise in Bolivia. On my way further south from time to time other cyclists came from ahead, like Dirk and Petra from Germany and Switzerland. So they asked: "And will you go all the way down?" And with a big grin I was answering: "Yes! And what about you? Do you go all the way up?" And there was nothing telling anything about these incredible distances we were just talking about! I wished them good luck for their way to Alaska and so they did for mine to Ushuaia at Tierra del Fuego. But the following day I met some seriously admirable cyclists: Family Perus from France. Three children, two tandems and a small bicycle, bags full of school books, on their way around the world for one year. I was deeply impressed of their way to manage their everyday life and slowed down for a couple of hours to join them on the way south. It was by all means a very nice and unforgettable morning and we hoped to meet up again further south in Bolivia. In the evening I reached Lake Titicaca at 3,810 m above sea level. With Puno as a starting point I visited the floating Uros Islands. As always, I tried to catch the cheapest possibility to get there, and so, consequently, got the oldest boat available. Therefore it was not astonishing that, after several breakdowns, I found myself got stuck in the middle of Lake Titicaca. A couple of hours later we eventually went on with another boat. Despite that there was little left of their traditional life, it was a fairly nice experience to meet some of the Uros people. Unfortunately Bartek, I met him at the pier in the morning, had booked a 2-day-trip, so we planned to catch up at the southern end of the lake in Bolivia. So I was heading towards the Bolivian border next day. Receiving the Peruvian stamp marked the end of my incredible time in Peru. Never ever I had thought to stay for such a long time in this unique country! I almost felt sad now to leave, but it was time for something new: Bolivia was waiting!